At the best of times it's nearly impossible to avoid bees and wasps. Regardless of how most people view them, I'm a huge fan of bees and wasps. This is because they help pollinate plants to create food and they eat other insects. The upshot is that nature has armed them a defense that humans find painful, stings. I'll say this up front, I'm not a doctor, but I have been an outdoor educator for over 15 years, and I've been stung, or dealt with stings, in places you don't want to imagine (including the tongue). From these experiences I wanted to share with you ways to find bee sting relief and what to do for a bee sting if you are stung. 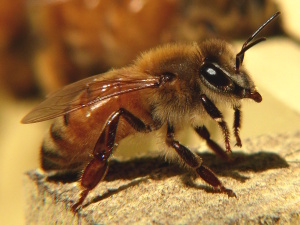 Common honey bee (Photo: Wiki Commons). Step 1. Get clear of the area where the bees and wasps are. If you're reading this post hopefully you are are far away from that area by now (I hope). Remember, whatever the case is, DO NOT SWAT!!!! I can't say this enough. If you're trying to flee an area, or if a bee/wasp is hovering around you, do not swat at it. If you stand still, take a deep breath, and just let it fly on then it will mostly likely ignore you. If you swat, you risk making it turn defensive and then likely stinging you. NOTE: For mass causality incidences (yes I've had one and they do happen), get everyone clear, call 911 (regardless, just do it) and then follow treatment protocols. Especially of concern are those stung around the mouth and face. Step 2. If it is safe try to identify the insect that has stung you, determine if you can, if it is a bee, wasp, or other creature. This isn't absolutely necessary, but it can help you understand your physiological reaction. Check out my previous post on telling apart bites and stings. 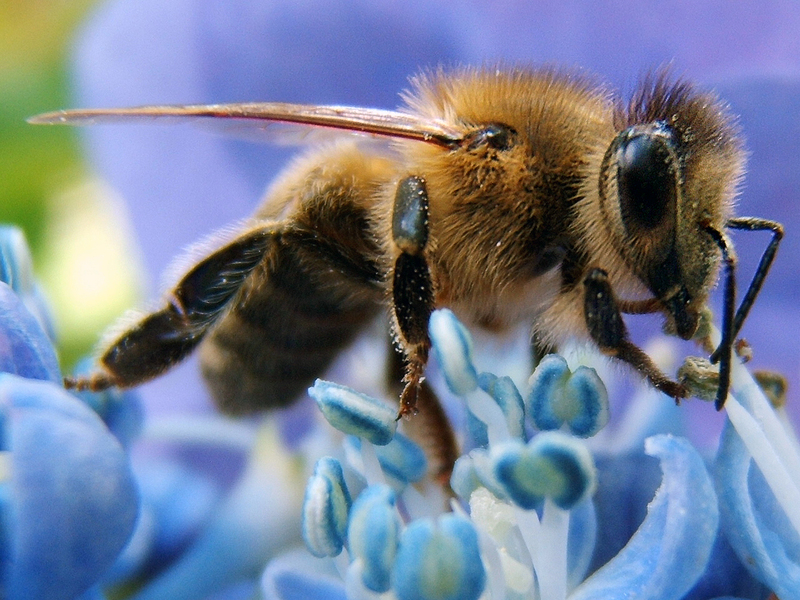 Remember, honey bees can sting once while yellow jackets, bumblebees, velvet ants, and wasps can sting many times. This is why it's important to get clear of the area where they are. If you can't tell don't stress, just keep going down the steps. Step 3. 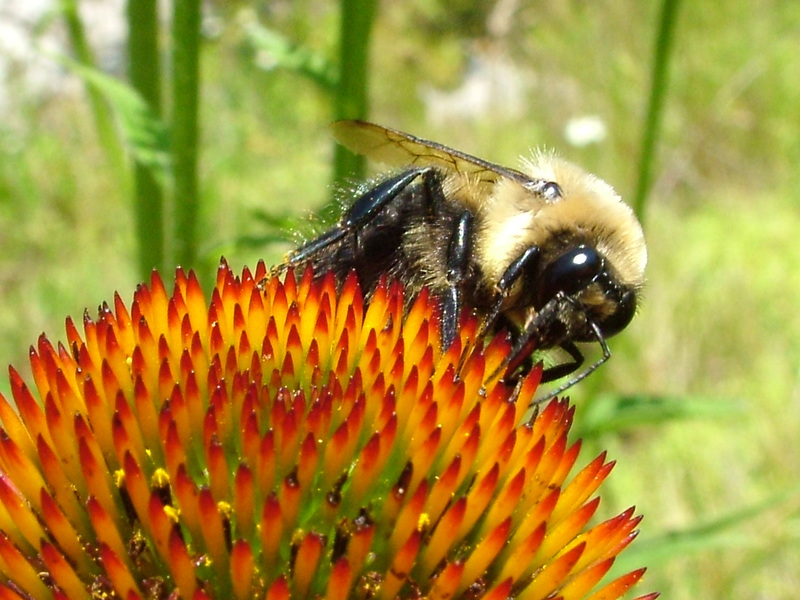 Call 911 if the person has an allergy to bees or exhibits signs of trouble breathing, faintness/dizziness, swollen tongue, or a history of anaphylaxis (reaction to stings). If the person carries an epinephrine (epi) pen then help them to inject it. 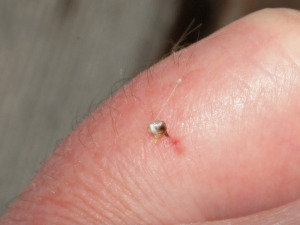 Here you can see a honey bee stinger with the venom sack still attached. Use a card to scrape it off, not tweezers! (Photo: Wiki Commons). Step 4. Remove the stinger. If you've been stung by a honey bee then they most likely it left a little present behind, namely their internal organs and a sack of venom that is still pumping venom through the hollow stinger. Remove the stinger using a credit card or with a fingernail. I don't suggest tweezers because more often than not, when you grab the stinger you will inadvertently squeeze the venom sac and more venom into the victim. Step 5. Circle the sting site with a permanent marker about 1/2" around with the sting in the middle. Now this sounds ridiculous but it's not. If someone is stung and goes into anaphalyxis and they can't talk to you, you want to know where they were stung. By circling the sting site you can also monitor the site for swelling. As the sting goes away it may also be hard to see and this will help you find the spot later. Step 6: Get Swelling Under Control. This means using ice on the immediate area. Ice for about 10 minutes, rest the area, then re-ice for 10 more. Also elevate any body part that has been stung, this will reduce swelling. If you're stung on the hand or foot remove any tight jewelry like hand or toe rings. It's also important to keep the person calm, this helps to decrease heart rate and slow the envenomation. Take an over the counter pain killer. Ibuprofen works well because it helps to reduce swelling. Acetaminophen also works. Don't give aspirin to anyone under 18, or those with heart problems. If you have an itchy reaction you can use calamine lotion or take an antihistamine. Toothpaste on the sting site can work too. The glycerin in the toothpaste is said to dry out the venom and most toothpastes are alkaline so it helps to neutralize the acids. Yellow mustard is not my favorite treatment but it does work when applied in a dot on the sting site. Mostly I find that it stains and smells pretty funky. It often contains vinegar, which is great for neutralizing the pain, and it can be anti-inflammatory. However, if you're working with kids you may want to skip this one. Tobacco juice is another good remedy. You can use leaves from a cigarette that have been soaked in a small amount of water. Crush the leaves so that the juices come out and then apply the leaves to the sting area. You should use a bandage to keep the poultice in place. DO NOT USE HONEY. As a former bee keeper I can tell you that bees are drawn to honey. On some websites is that you should smear honey on the sting. If you're stung by bees, and they are still in the vicinity or nearby the will find the honey and you will be surrounded by bees again. It's their food, they can smell it, and they want to collect it. Don't do it. Mud. As crazy as it sounds, if you are in a place where you absolutely don't have any other alternatives, dab mud over the area. Use a thick glob right on the area and allow the mud to dry. It absorbs the venom and when the mud crusts (dries) and you brush it off. I've found that dark (blackish) mud is most useful, but in a pinch, any mud will serve the purpose. From bitter experience I can tell you this works very well on wasp stings. Part of the reason mud works is because the basic nature of most muds helps to break down the bee venom and bring relief. Some muds also have salts in them which can help to pull a stinger to the surface of the skin too. 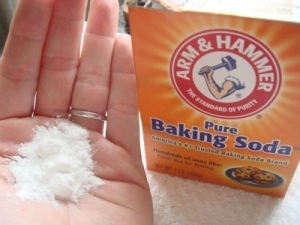 Epsom salt is a great remedy that most people overlook. The salts have magnesium and sulfate, which help to reduce swelling. To use Epsom salts you can either make a paste and then apply it to the area (about 1tsp and a 1/2 tsp of water more or less). The salt can also draw the stinger to the surface of your skin. This works effectively as a paste or as a soak. Watch this video for more information. You have to dissolve the Epsom salt in warm water first, then create a cold water soak by chilling it in the fridge. Step 8. Keep the area clean and dry. You can re-apply ice, use baking soda pastes, and Epsom soaks until the pain recedes. One of the best things I've found for kids are character band aids and distraction! No one wants to get stung, so it's best to avoid it. If you'd like to know more about why and how our bodies react to bee venom, and stings, then visit my previous post on bee stings and bites. It may also help you to be able to identify the difference between paper wasps and yellow jackets in your yard. Check out this post too. Posted in Insects, Venomous and Poisonous Creatures and tagged bee sting remedy; bee sting relief, what to do for a bee sting on May 5, 2015 by Infinite Spider.